White circular base with four pebbles attached with black thread. Shapes are cut from sheets of high pressure laminates. The maker draws round the patterns and cuts them out by hand with a fine piercing saw blade to prevent chipping. For the pebble brooches the maker uses either Colorcore (made by Formica) or diafos, a translucent laminate made in Italy. The edges are then machined on a linisher and polished. The brooch pin and catch are attached with small brass screws and then riveted. The hinge and catch are soldered onto the brass screw. They are silver. The maker collects the pebbles from beaches in Cornwall and Devon and arranges them on boards in her workshop. She does not polish them. The pebbles are selected for each brooch, drawn around with pencil and drilled for holes for the strings. 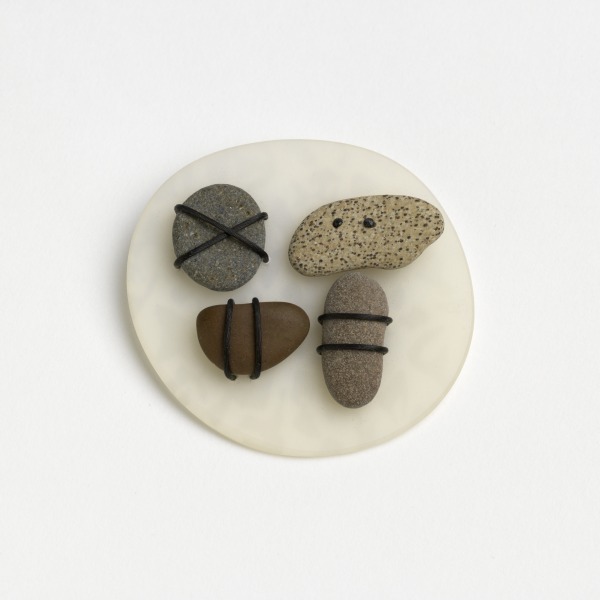 Pebble Brooch, Louise Slater, 1992, Crafts Council Collection: J212. Photo: Todd-White Art Photography. I design a new collection about every 18 months using a completely new laminate or plastic. These brooches are made from a French laminate keyed on the back for glueing and I have been able to develop this group of work as I have come across a suitable glue for laminating. When I have worked out a series of designs for new material, I make patterns and draw up a catalogue and price list. I repeat each piece to order. I usually continue making the colection for about three years, so I have three groups of work in production at any one time.